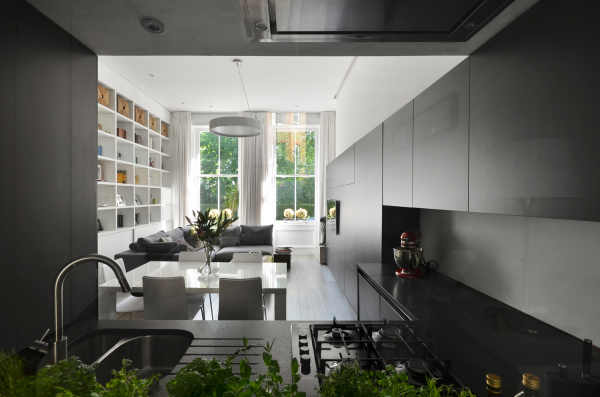 Located at the raised ground floor of a late XIX century Edwardian terrace building, the project for the Nevern Square Apartment has been conceived to turn a 69 sqm (and 5-windows only) self-contained flat, unmodernised and very fragmented as result of a poor 1970’s conversion, into a comfortable and fully equipped apartment, plenty of innovations and specifically designed to suit the needs of a young family. 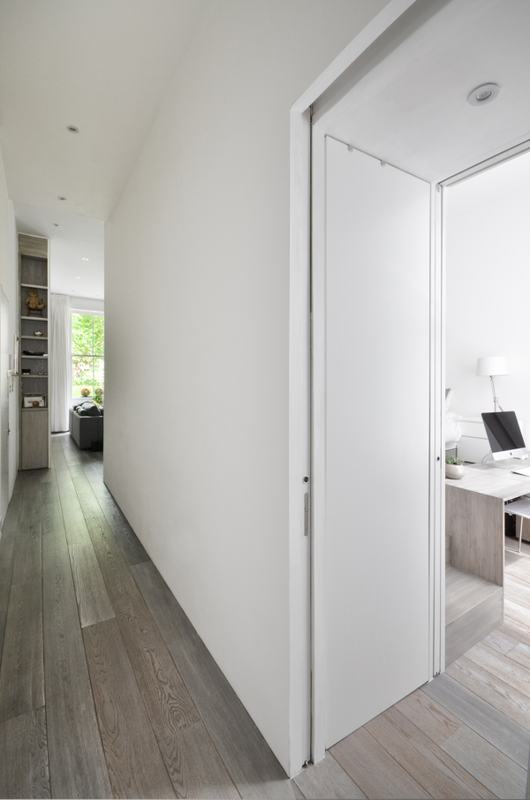 The Design concept is based on a contemporary reinterpretation of the typical Edwardian 2-rooms layout, with one large room at the front and one at the rear, developed through the balanced intersection of 2 opposite ‘L’: The White ‘L’, full height (3,80m) which incorporates within partitions a number of useful wardrobes and cupboards, The Black ‘L’, 2,25m high, which is a multiple functions bespoke furniture that includes: Kitchen, Spirits-bar, CD/DVD storage, TV-furniture, etc.. 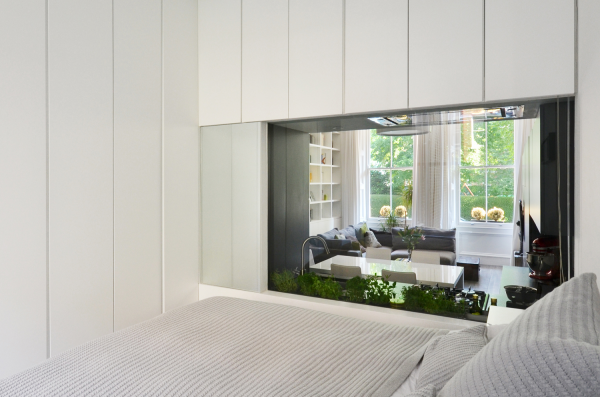 It is the intersection between these two ‘L’ that generates the element that makes the project unique: a large glazed internal window that gives to the front and rear rooms extraordinary visual depths and continuity, a beautiful view from the master bedroom toward the leafy Nevern Square gardens, and privacy through a dedicated concealed screening system. ‘We love this area and this place, and we appreciate these historical buildings, but we would like to live in our time’. This is what the clients, a young couple with a baby, told me when they asked me to re-design this flat to make it their own home. ‘We are contemporary design lovers’ they said ‘and we would like to combine the feelings of the historic fabric with all the comforts, the practicality and the beauty of a contemporary living’. Their new home should have been elegant and relaxing, with panoramic views toward Nevern Square and plenty of natural sun/daylight. ‘We like open plans and communication between the spaces, but we also like our privacy’ they told me. They were aware of the relatively small size of the apartment and this is why they asked me to make it looking ‘visually’ bigger, deeper. 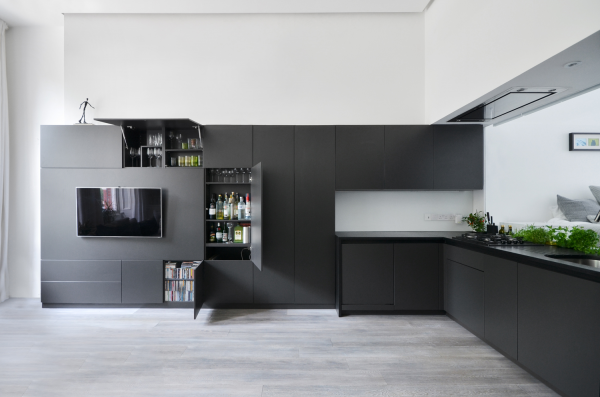 As young family with growing and changing needs, they asked me to incorporate concealed and very discreet facilities and storage spaces everywhere. ‘Our daughter is our joy’ they said ‘and we would like the apartment would be designed also to allow us to keep an eye on her while she plays’. 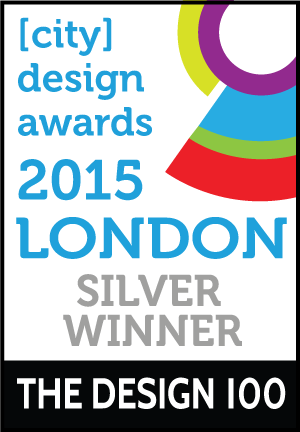 The design we developed necessarily involved a number of innovative and challenging solutions. The ‘See-through’ Kitchen has a large glazed internal window that provides natural light, visual dept and views through the spaces. 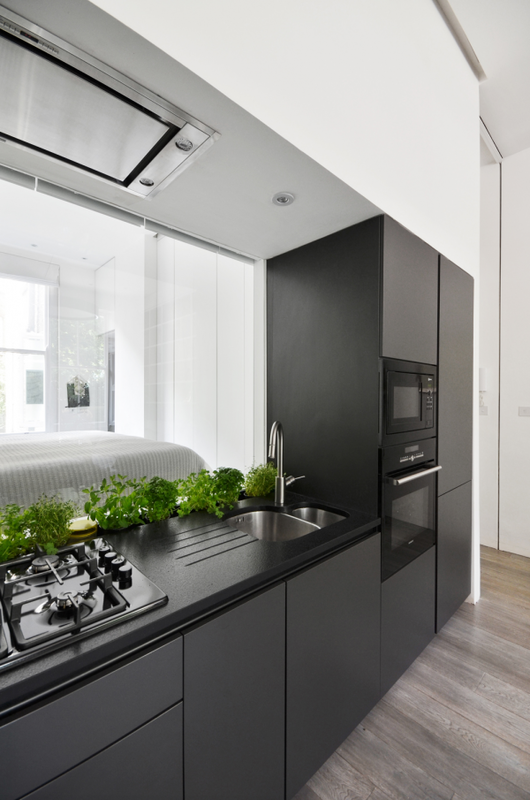 It has all the small appliances concealed into cabinets for a neater look, and a channel cut into the worktop to grow fresh herbs. 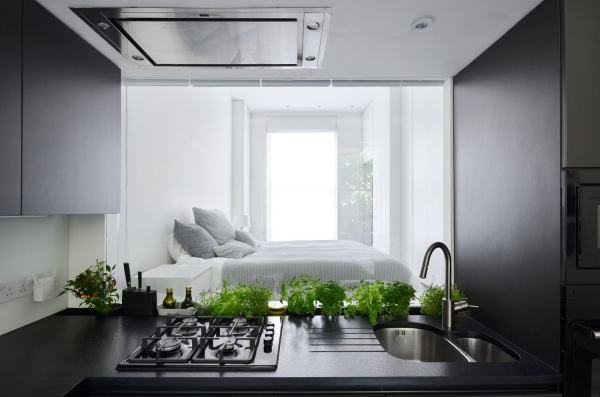 The Master bedroom has a 60 cm high podium that provides useful storage space and easy access to the suspended cabinets. This podium becomes a desk, creating a practical studio area, and makes the overall perception of this very high room (3.8m) more proportioned. 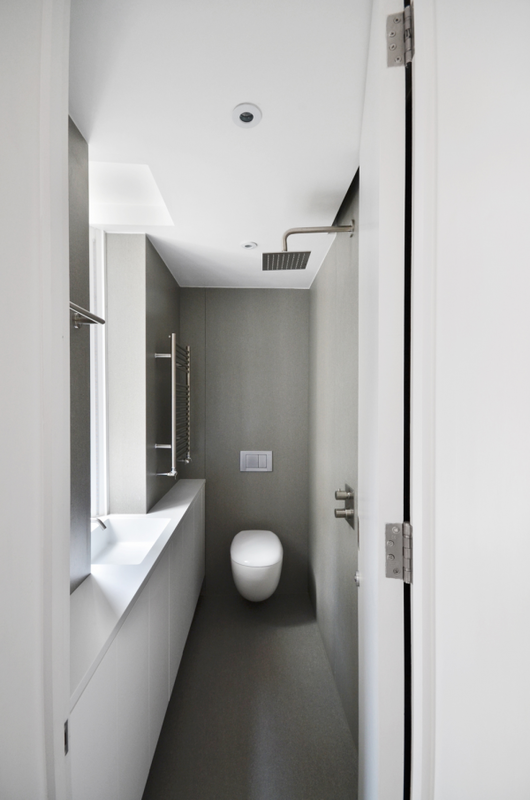 The open wetroom is a fully waterproof room, en-suite for the master bedroom or shared thanks to a double sliding doors system, with the floor covered with a unique jointless porcelain slab and the shower drain hidden under the sink furniture for a cleaner look. The family bathroom, fully bespoke to follow client’s needs, is covered with extraordinary sized porcelain slabs, which are only 3.5mm thick (7mm for the floor) and have fiberglass nets bonded on their backsides in order to be resistant and flexible (they can be turned with a ray of 5m!). I realized the overall project would have been very challenging since our second meeting with the clients, when they essentially required to locate and design 11 dedicated areas/rooms (living, dining, kitchen, corridor/lobby, studio, utility, laundry, 2 bedrooms and 2 bathrooms) plus a lot of integrated storage spaces into an apartment of only 69 sqm and with 5 external windows only! Their place should have looked anyway spacious, smart and elegant, well lit, comfortable, and friendly also for their little daughter. I was thrilled and concern at the same time, and this is actually when I thought at a two opposite ‘L’ layout, to organize in a depth of only 10.85m and within the two main rooms: Living-Dining-Kitchen-Master Bedroom-Studio together with an internal laundry/utility and concealed storages, and positioning bathrooms and the second bedroom at the rear. It hasn't been simple at all, but luckily we made it! The project required 21 weeks of substantial remodelling works, including fully new structures to support the 17 tons coming from the four storeys above, the entrance door relocation and the installation of a concealed full height fire curtain, to allow the particularly opened layout. Clients were so happy and excited. 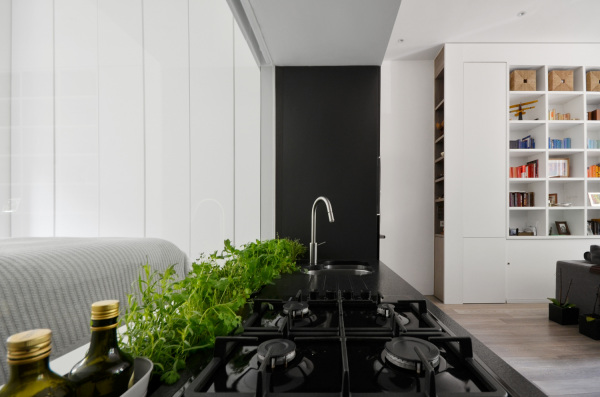 In order to achieve appreciably higher sustainability and living standards, the refurbishment and the retrofitting works carried out in the apartment included full thermal/acoustic insulation of the floors, ceilings and external walls, the installation of new and more efficient services and a specific lighting strategy. Both natural and artificial, lighting has been studied to give a pleasant feeling of ‘continuity’. 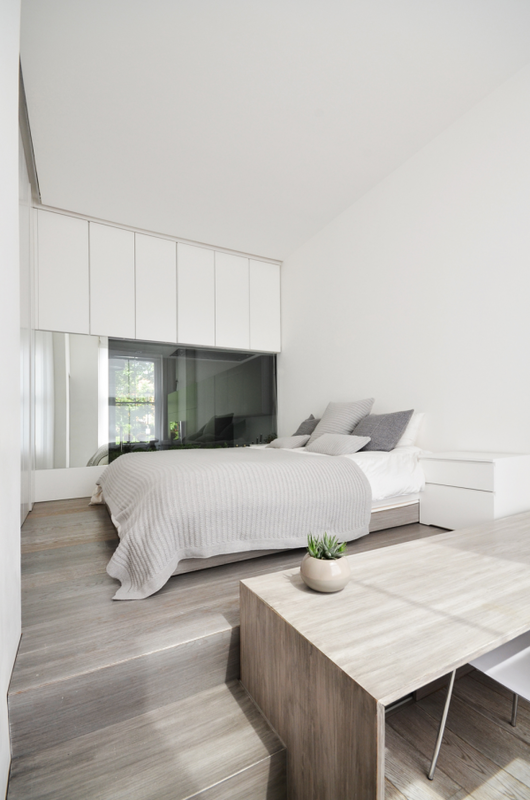 Considering the orientation of the building, the natural Sun/daylight light gets in the living spaces in the morning and in the Master bedroom in the afternoon however, thanks to the glazed window in between, both of them can enjoy the light reverbs throughout the whole day, with a considerable energy saving as result. In support of the natural light and to better balance its decrease at dusk, 15m of energy efficient (14W/m) linear led lights have been installed in cuts formed on the ceilings at their junctions with the rooms walls, following the two ‘L’ shapes. These lights, which have a temperature close to the natural daylight and are controlled by wireless dimmers, really help to produce a smooth light transition between the daytime and night-time hours, resulting in a more sensible energy consumption.